Objective: Magnetic Resonance Spectroscopy (MRS) is a noninvasive in vivo technique extensively applied to assess the levels of neural metabolites in the brain. We aimed to summarize the findings of proton spectroscopy (1H MRS) studies addressing neuro-metabolite findings in the Basal Ganglia (BG) of patients with Bipolar Disorders (BD). Method: A search of PubMed and Ovid databases was conducted to identify ¹H MRS studies since 1990 reporting N-acetylaspartate (NAA), phosphocholine plus glycerophosphocholine (PC+GPC), and creatine plus phosphocreatine (Cr+PCr) levels in the BG of patients with BD. Results: Ten original studies were included in this review. Three studies involved BD patients with depressed mood, six studied euthymic BD patients, and one study looked at manic subjects. In depressed BD patients, three studies reported elevated PC+GPC and Cr+PCr levels in the caudate and putamen. NAA levels were found to be elevated in two of the studies, while one reported no change. In euthymic BD patients, five studies reported no group differences with respect to any metabolites, and one study found differences in PC+GPC/Cr+PCr associated with lithium treatment. In mania, lower PC+GPC, lower NAA levels, and increased Cr+PCr levels were described in the caudate of BD patients compared to HC. 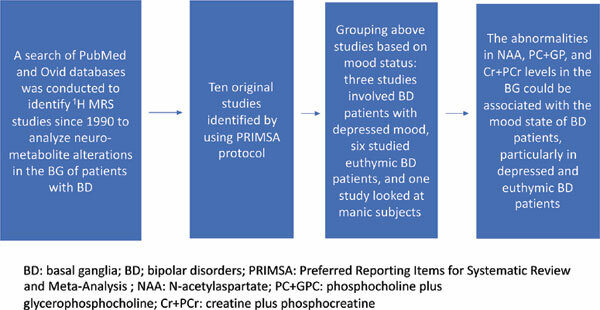 Conclusion: This review suggests that abnormalities in NAA, GPC+PC, and Cr+PCr levels in the BG might be associated with mood state among BD patients. In addition, the methodological issues involved in the heterogeneity of 1H MRS findings in BD, as well as the potential role of 1H MRS findings as biomarkers for BD, are discussed. Keywords: MRS, bipolar disorder, basal ganglia, striatum and caudate, N-acetylaspartate (NAA), phosphocholine plus glycerophosphocholine (PC+GPC), and creatine plus phosphocreatine (Cr+PCr). Keywords:MRS, bipolar disorder, basal ganglia, striatum and caudate, N-acetylaspartate (NAA), phosphocholine plus glycerophosphocholine (PC+GPC), and creatine plus phosphocreatine (Cr+PCr). Abstract:Objective: Magnetic Resonance Spectroscopy (MRS) is a noninvasive in vivo technique extensively applied to assess the levels of neural metabolites in the brain. We aimed to summarize the findings of proton spectroscopy (1H MRS) studies addressing neuro-metabolite findings in the Basal Ganglia (BG) of patients with Bipolar Disorders (BD).